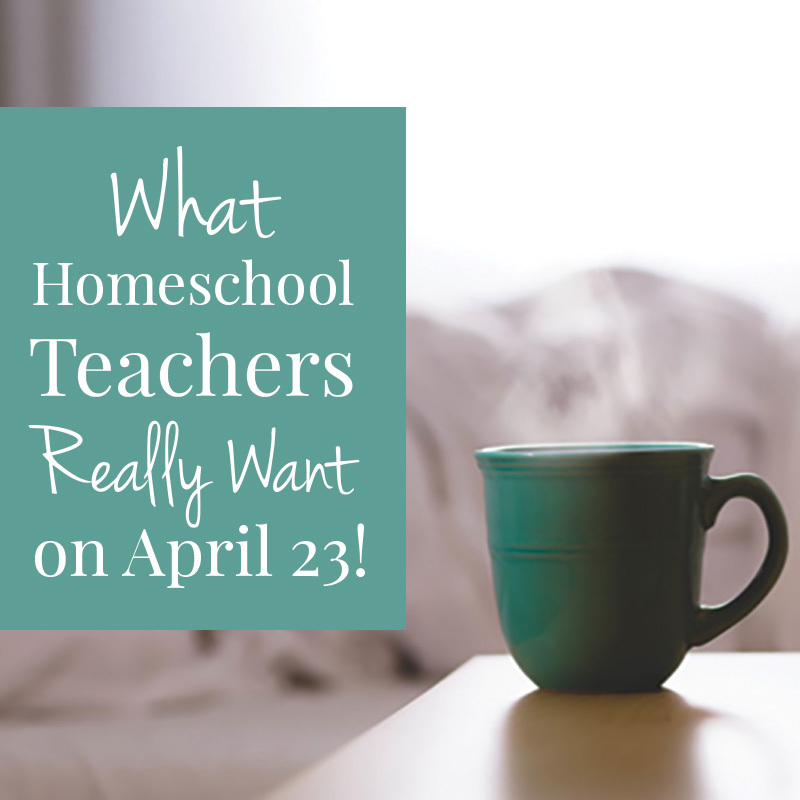 You are here: Home » What Homeschool Teachers Really Want on April 23! First of all, you’re probably wondering what is so important about April 23, huh? Well, April 23 just so happens to be Homeschool Teacher Appreciation Day. And we here at HSLDA want to help you, homeschool teachers, celebrate that special day! This entire week we’ll be sharing encouraging content on our blog, Facebook, Instagram, and Twitter that’s geared towards the hardworking homeschool moms and dads around the world! We want you to know you’re valued and that what you’re doing matters. Furthermore, we want to help you celebrate Homeschool Teacher Appreciation Day in style. HSLDA’s homeschool mom bloggers share ways they would like to celebrate and be appreciated on April 23 (and beyond). 1. Some time off, shopping by myself! 2. Older kids to help keep the younger ones happy so I can get stuff done around the house. 4. My nine-year-old to make me a Keurig coffee in the morning. 4. Husband to make assignments and check up on them that day. 1. Kids to clean their rooms without complaint. 2. Dad to work with the kids to come up with a dinner plan and execute it. 3. Everyone to pick up the house on their own. I would love to see the non-primary teacher (Dad, in our case) come in and do the teaching for a day while the primary teacher (Mom) gets a day off to plan or focus on household tasks that get neglected in the day-to-day. 1. Remember that you can’t do it all. So do your best, and seek help from other homeschool teachers. 2. There are so many homeschool teachers going through the same trials and triumphs that you have in your homeschooling journey. So take courage in knowing that you’re not doing this alone. 3. Homeschooling looks different for every family. So embrace the style and rhythm that works best for you and not what someone else says will work for you. 4. Take a moment out of each week to stop and see how much progress your kids have made, and not how much you have left to do. 5. In the crazyness of your homeschooling journey, remember to take time to do what you love. For more ideas to celebrate April 23, and to help you along your homeschooling journey, check out HSLDA’s Pinterest, including our boards For the Teacher, For the Moms, Family Time, and Homeschool Encouragement. Plus, go check out Apologia’s Homeschool Teacher Appreciation Day page for special offers through out the day of the 23, as well as lots of giveaways (including some items from the HSLDA Store), and free webinars! Be sure to let us know on Facebook, Twitter, or right here on the blog some ways that you’re celebrating the 23! And if you’re a child, or the non-primary teacher in the family, we’d love to hear some ways you celebrate and appreciate your teacher! Plus, stay tuned for a really fun giveaway coming to the blog in the next few days. Photo Credit: HSLDA, Noelle Blankenship; small banner graphic design by Charity Klicka.